Live album recording in December in Indy! We hope you've been having a great summer so far! We have some BIG news: we're going to be recording a live album on Friday, December 6th and Saturday, December 7th at the Melody Inn in Indianapolis!!! We'll be joined on Friday by the legendary Volcanos and the incredible Concussions!!!! And then on Saturday we'll be playing with Patrick's OTHER two bands, the epic Five Year Mission and the gorgeously melodic and hummable Shake Ups!! Come take advantage of this opportunity to see a legendary third wave surf band, one of the best modern surf bands around right now, the greatest Star Trek themed band in the Universe, Indy's best indie band - oh, and US! - and be a part of something a bit special, a live CD recording! Those don't happen very often! We hope to make these two shows pretty special and unforgettable. Stay tuned for more details coming soon. We've got a few 'live recording warm-up' gigs before then, including our return next weekend to Champaign, IL for another always-amazing Surfabilly Freakout Surfy Murphy's Beach Riot, as well as the raucous Melody Inn's Punk Rock Night in Indy! Then on Saturday, October 5th, we'll be hitting Athens, OH for the first time, with the local surf favorites, the D-Rays - really looking forward to that! We hope to see you at some of these shows, and DEFINITELY hope to see you in December for the recording of our live album! Greg and Inga Gardner drove 16 HOURS ONE WAY to be at this show, all the way from Manitoba, Canada!!! Absolutely incredible! Greg has a surf radio show and is a huge fan, and he shot our entire set on video (in three parts), for which we are very grateful - of the many shows we've played, it's really nice to have this one in particular preserved for the ages. Check out the videos (see below) - the second of which contains TWO brand new Madeira originals: Caravela and The Farthest Shore. Hope you enjoy the videos a tenth as much as we've enjoyed this show, and special thanks to Jon of the Exotics for organizing the whole thing, to Greg and Inga for driving so far and shooting these videos, and to all the wonderful people on the boat that night (maybe some of you)! We hope you're all enjoying your summer! Pipeline honors us, NPR features us! The long-running UK surf/instro magazine Pipeline has selected "Tribal Fires" as the runner-up for the album of the year for '12! (The winner was the Finnish band the Dangermen with their great debut "Meet the Men of Danger".) Given that so many phenomenal releases came out this past year, this is a great honor. 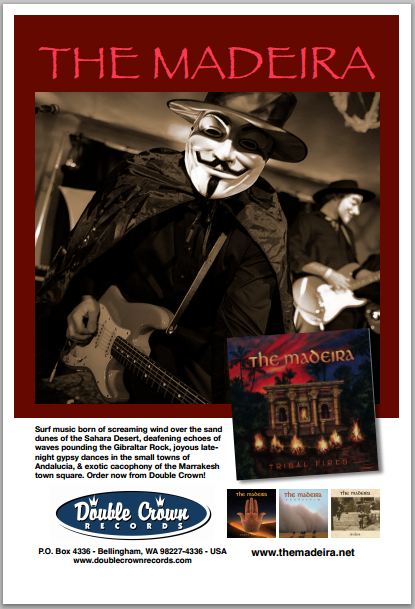 Pipeline in the past selected "Sandstorm" as runner-up for the album of the year for '06 and "Carpe Noctem" as one of two albums of the year (with Los Jets) for '08 - this kind of recognition is rare, especially for a surf band, and we are deeply grateful to Pipeline's support over the years! The other recent big news is that on January 10th the "Morning Edition" show on National Public Radio (NPR), the most widely-listened morning show in the country, featured our own "Tribal Fury"! It was used as 'bumper music' into the bottom-of-the-hour news. The show is played on all NPR stations nationwide, so the song was heard by a lot of people. (And we did indeed get coast-to-coast reports.) You can hear the original segment here (Tribal Fury starts at 3:39). Thanks to Morning Edition and NPR! We had a *blast* playing the Punk Rock Night to a packed house at the Melody Inn last month, and thanks to them for inviting us - we hope we get to do it again very soon. We're returning to Dayton, OH for a show with Team Void this Saturday (see the Shows page for all the details), and we hope to see some of you there! We're also returning to Michigan in April, and then off to North Carolina again for another fantastic Instro Summit in early May! Good stuff ahead - and new songs are coming along, we hope to unveil a few of them at the upcoming shows. Finally, happy Valentine's Day - the Madeira sends you our love! We hope you are greatly enjoying the holidays, and your stockings are overflowing with surf CDs! We wanted to give you one final update for the year, as there are a few items worth noting. First, we will be playing the Punk Rock Night at the Melody Inn in Indy for the first time ever on Saturday, January 12th. It'll actually be more like a Surf-Punk Night, as we'll be playing with our friends Team Void from Dayton, OH, as well as two other surf(y) bands. We very much hope you''ll be able to join us for that show, and kick those January blues with some hot surf/punk music! Second, we were thrilled to find out that El Sotano, the weekly surf music show on Spanish National Radio hosted by Diego R.J., selected our song "Tribal Fury" as #3 of the best 20 surf tracks of 2012! Thank you very much, Diego! You can hear the show online - check it out! Third, we are happy to announce that our good friends at Surfabilly Freakout Radio in Champaign, IL, just released a fantastic new compilation CD "Throttlebilly Beach Riot! ", chock full of surf, rockabilly, psychobilly, garage and more - and among these 20 tracks of doom is our own "Burning Mirage"! Thanks to Jet Sterling, Chelsea Bandita, Koffin Keith, Motorhead Mike, and all the rest of the Surfabilly crew for doing us the honor of including us among all the great bands, the Nebulas, Daikaiju, the Cocktail Preachers, the Love Me Nots, Knuckel Drager, the Men from S.P.E.C.T.R.E., Vegas 66, etc. We also greatly appreciate all your support through the years! Learn more about the CD - or simply order it for ONLY $10, here. Finally, we thought we'd mention that we will be starting to work on some new songs again (hopefully for the next CD) at our next practice in less than two weeks! With Tribal Fires now almost a year old, we figure it's time... We hope to unveil the new songs at our upcoming shows, and we've got some great ones planned for the next six months, with return visits to Ohio, North Carolina, and hopefully Michigan (working on those right now). Keep checking our shows calendar, and hope to see you at one of them. Until then, we wish you a very HAPPY NEW YEAR! We hope you're having a pleasant Fall, and (always!) enjoying some good music. There are a few things going on with the Madeira that we'd like to let you know about. First, we will be playing our final show of the year tomorrow night (Friday) in Cincinnati, OH, with three other great surf bands, and it'll be a Halloween show, so full costume - see all the details on our gigs page. We've had a great year, having played more shows than ever before, from North Carolina to Wisconsin to California, some of them being our best ever! Thanks for coming out to see us if you did, we greatly appreciate it, and maybe we'll see some of you tomorrow. Second, we were thrilled to learn that the new issue of Pipeline Instrumental Review gave "Tribal Fires" a fantastic review, and editor Alan Taylor selected it as #1 in his Top Ten for the issue! (You may recall that Pipeline selected "Carpe Noctem" as one of the two albums of the year in '08, and "Sandstorm" as one of the three runner-ups to the album of the year in '06.) We also found out that the Indianapolis free weekly paper Nuvo ran a cool comic (!) about the Madeira on August 23rd, right before our Melody Inn show - we completely missed it! You can see it here or on Nuvo's site. Finally, we've added a ton of videos from this summer to our YouTube channel, many of them from the SG101 Convention in California and the Oxford Battle of the Surf Bands in Oxford, OH, both amazing shows. Check them out! We hope to start working on some new material at the beginning of the year, so stay tuned for that. Until then, we hope you have wonderful holidays, and hope to see you in person in 2013! We hope you're having a great summer, and listening to a LOT of surf music! :) We just returned from our California mini-tour which was simply EPIC! Suffice it to say, we played some of our best shows ever with some of the best surf bands ever! You can read Ivan's report of the tour here. And here's a great video from the Surf Guitar 101 convention of us doing Intruder. Thanks so much to all of you that came to support us at any of the five CA shows - we greatly appreciate it. Ivan recently did a lengthy interview with Warren Springfield for the online publication Fine Print Magazine - check it out here. Finally, we have four shows coming up in the next four weeks, covering Indiana, Illinois and Ohio. We start next weekend with our return to the Melody Inn in Indy, followed the next day by our return to Mike'n'Molly's in Champaign, IL, then followed two weeks later with a very special show in Chicago and a week after that in Oxford, OH - you can check out the details on our Gigs page. We may play one more show this Fall, but this will be basically it. It's been a busy six months of playing and traveling, and we need to regroup a bit. So, we very much hope to see you at some of these shows! And of course, we'll have the new super-cool, Steve-Blickenstaff-designed t-shirts for sale at all of these shows, as well as our new CD "Tribal Fires"! Summer 2012 update - California, here we come! We sincerely hope you're having a great summer! It's been a fun one for us - and things are about to really speed up over the next six weeks! First of all, "Tribal Fires" has been out for almost five months now, and is doing great! We've received half a dozen excellent reviews so far, and we expect a few more to come. We've also gotten many truly nice words about the CD from you, and we are both grateful and very happy to hear them. Double Crown tells us that they are very pleased with the sales so far, so thank you for that as well! Second, we've been getting out and about over the past few months: We had a great weekend in early May in North Carolina, playing the AWESOME Instro Summit in Chapel Hill, where we got to meet one of the newest of our favorite people, Cousin Crispy, and shared the stage with many great bands such as the Mystery Men?, Kill, Baby...Kill!, and in particular the amazing Aqualads, who we were privileged to play with twice that weekend! We were also very lucky that we got to play twice in mid-June with the simply awesome Exotics, both on their home turf of Milwaukee, WI and in the Chicago burbs! Both weekends were a real blast - thanks to all the people that made these shows happen, we really hope we get to do it again soon! Finally, we're about to commence a super-busy period (at least by our standards!) - nine shows in four different states in six weeks! We start our five-show California tour in just ten days, followed shortly after returning from CA with back-to-back shows in Indy and Champaign, IL, and then Chicago and Oxford, OH just a couple of weeks after that. The five California shows should be quite epic - playing two gigs around San Francisco with two completely different setlists (one highly energetic, one completely mellow), then San Diego followed by the world-famous Surf Guitar 101 Convention in Los Alamitos, then finishing up at the Huntington Beach pier, four years almost to the day since our last time there! And we get to play with so many of our good friends and some of the best surf bands in the world today: Jon & the Nightriders, El Ray, the TomorrowMen, the Exotics, the Secret Samurai, the Cocktail Preachers, and many, many more! (For full details on all these shows, please check out our Shows page. Lots of good stuff ahead! We very much hope to see some of you at some of these shows. And if not, well, we're already working on setting up some Fall gigs, so stay tuned! It’s been three weeks since the official release of “Tribal Fires”, and it’s now widely available, both in physical and download versions (including through Amazon and iTunes). We very much hope that if you’ve picked it up you’re enjoying it. If you are, please consider leaving a few comments on Amazon and/or iTunes and hype it up for us a bit! We have big plans for the next six months or so, playing all over the US in order to promote the new album, including a couple of shows in North Carolina in early May; Chicago and Milwaukee (our first time there) in mid-June; five shows in California in early August; and several other shows in the works for August and September, including another show in Chicago, as well as Champaign, IL and Oxford, OH – stay tuned for those. We wanted to in particular draw your attention to two amazing shows we’re honored to be part of this spring and summer. First, the Instro Summit, a 3-day festival held on May 4th-6th at the Cave in Chapel Hill, NC, and featuring bands from all over America performing surf and instrumental rock. We’ll be playing on Friday, May 4th, along with our Indy brethren Destination: Earth!, as well as an incredible lineup of surf bands including Aqualads, the Mystery Men?, Kill, Baby…Kill!, Killer Filler, and Weisstronauts. If you’re a surf/instro nut living anywhere close to the East Coast, then this is a must-attend event! Second, we’re incredibly excited to also be playing the 5th Annual Surf Guitar 101 Convention at the Starting Gate, in Los Alamitos, CA, on Sat. Aug. 11th (10am to 8pm), along with a mind-blowing collection of bands from the US and Europe, including the reunion of Jon & the Nightriders (!! ), El Ray (Denmark), the Exotics (Milwaukee), Los Venturas (Belgium), the Dynotones (SoCal), 9th Wave (CT), and the Intoxicators (FL). There will also be the SG101 members jam, the legends jam and tribute hour, a huge vendor room, raffles and giveaways. and much, much more… It’s going to be an unforgettable party, and we sincerely hope you can join us for it! Please check out our Shows page for all the details as well as an up-to-date listing of all of our upcoming shows – and keep a close eye on it for continuing updates. We’ll be starting our US blitz with return to Lafayette, IN on Friday, April 14th, and we’re thrilled that we’ll be joined on stage for the first time ever by Brad Harner, the percussionist on both “Tribal Fires” and “Carpe Noctem” albums! It should be a blast! We hope to see you somewhere in the US in the next six months! Until then, have a great spring and summer! You can now pre-order the Tribal Fires CD through the Double Crown Records website (or you can get a copy from the band at the March 2nd CD release show at the Melody Inn). The CDs will begin shipping March 3rd. If you are a Double Crown Music Club member, it will automatically be shipped to you. You can now hear three songs (“Tribal Fury”, “Cities of Gold” and “Twilight”) on our MySpace site. The release date is March 6, 2012, though we will have CDs available for sale at our album release show on Friday, March 2, 2012 at The Melody Inn, Indianapolis, with the Cocktail Preachers and the Mystery Men? More info soon – stay tuned. Until then, hope you enjoy the three new tracks, and that we’ll see you in Indy on March 2nd!